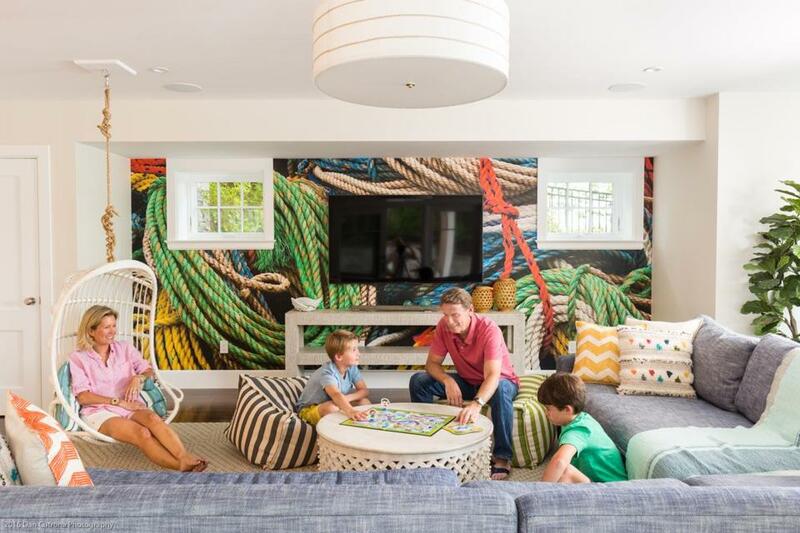 A stylish New Seabury getaway serves as the perfect refuge for a family in need of a break. The rec room opens onto a patio and pool. Heather Shanahan understands when you need to cede control. 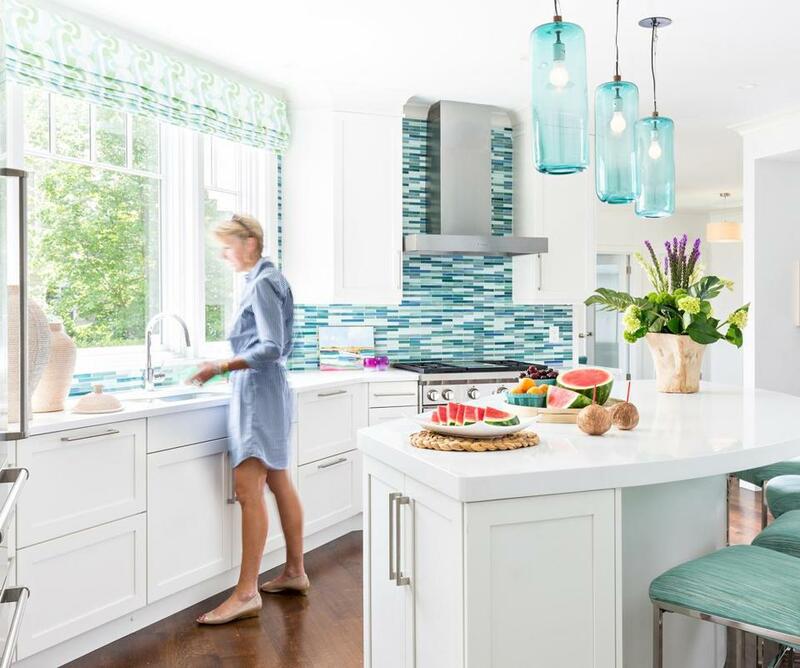 In the midst of overseeing the design of her family’s summer house on Cape Cod 18 months ago, she was diagnosed with cancer. “Suddenly the house was the least of my worries,” recalls the homeowner, who has since recovered. 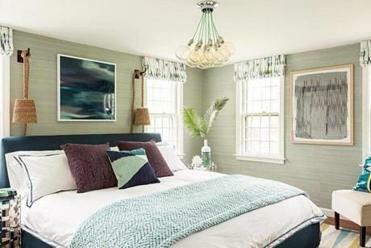 Luckily, when it came to their New Seabury house, Heather and her husband, Rob, had no qualms about putting their trust in Deborah Berger of Maven Interior Design. Berger had recently decorated the family’s home in Wellesley, so they were in synch. “Deb nailed it every time,” Heather says. Dvorsack designed the spacious Shingle Style house on a saltwater inlet. “It’s all about family, friends, and fun,” he says. The L-shaped structure cradles multiple decks that connect the interior to the exterior. The piece de resistance is a roof-deck bar that looks out over the treetops to the water. Summertime, and the living’s pretty. 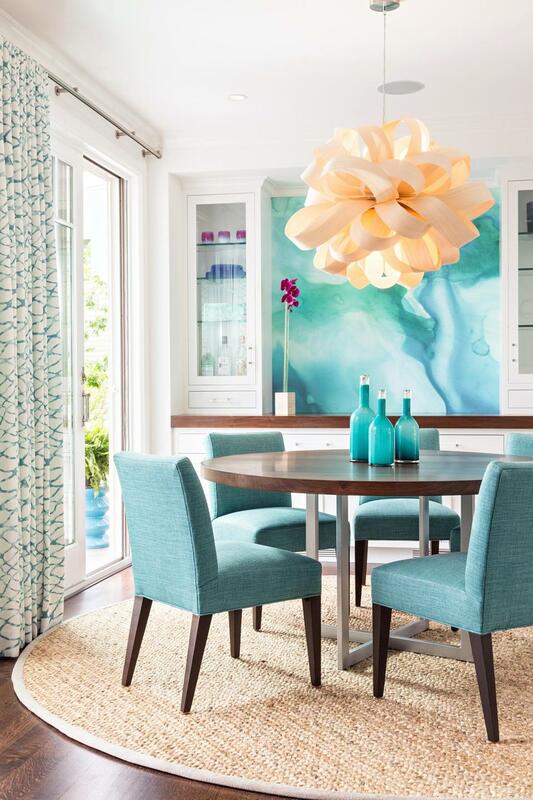 A watercolor mural by Black Crow Studios makes an immediate impact in the dining room. A round table allows for easy access to the deck, where the family often eats. Berger likens the oversize wood-veneer pendant light over the dining table to an enormous blossom. “When illuminated at night, the effect is alluring, making it seem as though there is a party underway,” she says. A turquoise palette tinged with green carries through to the kitchen. Skinny glass mosaic tiles, cylindrical pendants, and low-slung stools play off an aerial seascape by photographer (and Instagram darling) Gray Malin. “The photo makes me want to jump up and down,” Berger says. 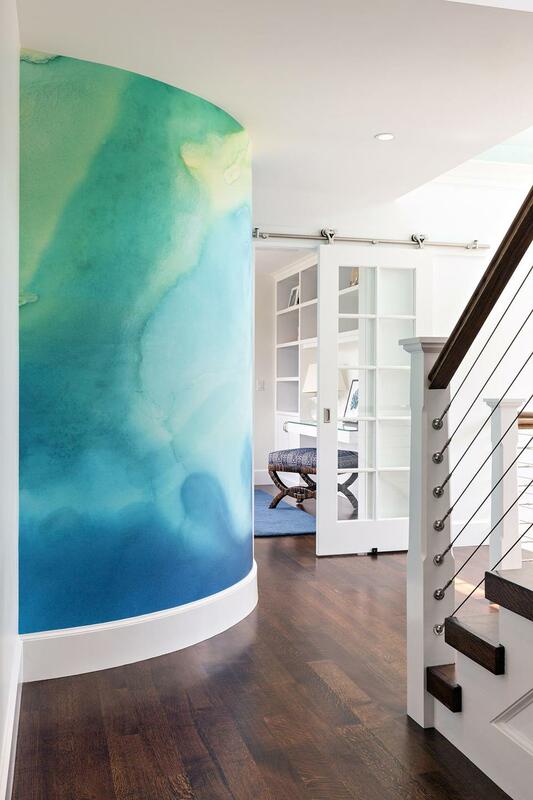 A watercolor mural in softer blues is an unexpected treat at the top of the stairs. (“There just wasn’t enough of it in the dining room,” Berger says.) Next to it, a sliding glass barn door leads to a bedroom shared by the couple’s sons, Johnny, 10, and Bobby, 8. With its built-in bunks, it was such a hit that on their first night in the house, Rob camped out with them. The rec room on the lower level is also made for fun, with a swing, television, and bar. A photo mural of brightly colored coiled rope adds a vibrant dose of pattern and color. Since kids (and adults) often wander in from the pool, Berger used indoor/outdoor fabric on the huge Restoration Hardware sectionals. In the rec room, Heather Shanahan sits in a hanging rattan chair from Serena & Lily while Rob plays a board game with Bobby, 8, and Johnny, 10. In the kitchen, a custom glass mosaic tile backsplash from Ann Sacks provides a big dose of cool color. The hand-blown glass pendants by Cisco are from Comina in Wellesley. The bunks in the boys’ bedroom are painted Benjamin Moore Downpour Blue to match the wave motif wallpaper, Thibaut’s Shore Thing in navy. In the dining room, the drapery fabric set the color scheme for much of the house. It’s a printed linen called Waterpolo in Lagoon, designed by Jeffrey Alan Marks for Kravet. A watercolor mural is a surprise statement on the second-floor landing.